Our custom-formed light guide film (LGF) product line is unique and offers several advantages over more traditional backlighting methods, such as its ability to evenly flood your product with light without creating hotspots. The keys, which are farther away from the light source, appear to be the same intensity as the keys closer to the light source — this is the result of a special process of printing on PET film. Light guide film is very thin, which allows the overall thickness of your keypad or similar products to remain thin and flexible. The LGF can also be placed directly onto a rigid PCB by means of a double-sided adhesive if desired. Due to the light-gathering properties of these custom-formed light guide films, fewer LEDs can be used in the product, which means lower lighting costs and less power drain for portable devices. LGF can be utilized behind silicone rubber keypads, membrane switches, IMD keypads, and even for backlighting plastic housings, or enclosures manufactured from different materials. Essentially, anything you desire to backlight can utilize LGF. 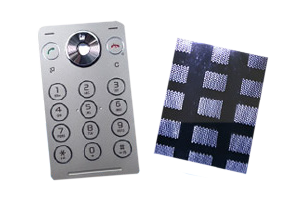 Keypads that backlight with LGF can be non-tactile, or metal dome arrays can be incorporated to provide a tactile feel without detracting from the lighting performance. Contact us today for more information about our custom-formed light guide films and other premium products.